Living in the United States or other “stable” countries, we tend to think that Hyperinflation is a relatively uncommon event but that is far from the truth. In our post What is Hyperinflation? We list 26 instances of hyperinflation 11 of which have occurred since 1990. It seems that every couple of years there is another one. Even in the midst of deflationary pressures we have seen Zimbabwe (which ended in 2008), North Korea (2010-13) and now Syria. Whenever you hear a country outlawing currency conversions or the use of foreign currency for local transactions a giant red flag should start waving in your head saying, “Warning, Warning, Danger, Danger”. Just as Zimbabwe and North Korea we now have Syria. 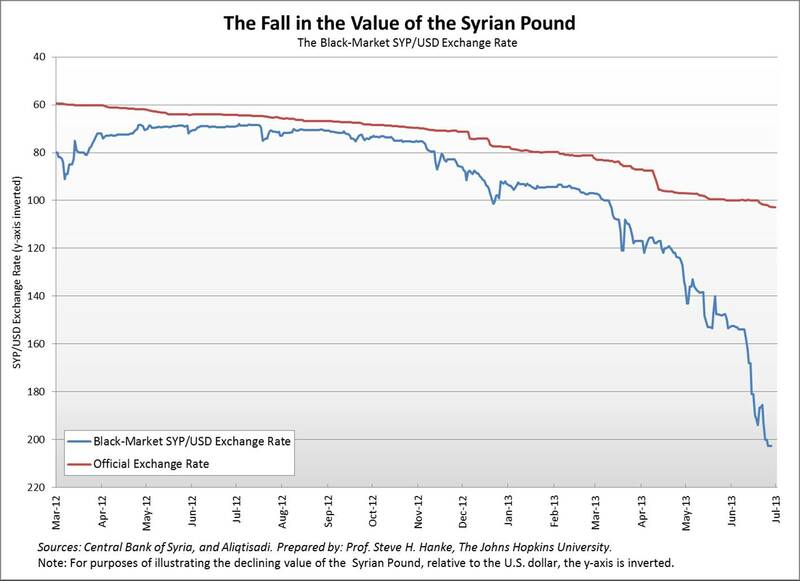 Syria is currently undergoing a Civil War and its currency is suffering the typical hyperinflationary fate. One reason currencies of countries in a Civil war suffer is because the government prints massive quantities of new money to pay for their war. The other reason is uncertainty. If a new government takes over will it honor the old currency or will it just repudiate it and start over with no debt and a new currency? According to the state news agency SANA, originally Syria’s president Bashar al-Assad has said, “It is prohibited to make payments, reimbursements, commercial transactions and any other commercial operation in foreign currency or in precious stones.” Often these crazy proclamations end up carrying increasingly serious penalties, currently Syria has instituted 10 year prison terms for “Black Market currency transactions” but history has shown that even the death penalty doesn’t stop trading in foreign currencies when the local currency is losing value at an extremely rapid pace. This is possibly because people have no choice, if they don’t want to go bankrupt. Money is meant to not only be a medium of exchange but also a store of value, but if it loses 90+% of its value in a month it is not performing its value storage function very well. Recently, in places like Argentina the “unofficial” exchange rate would get you twice as many Pesos for a dollar than the official rate because the local currency was depreciating so quickly. Note: What one country calls the “Black Market” another country calls the “Free Market”. As we can see in the chart below, one reason people trade on the “Black market” is because the “official” exchange rate has no basis in reality. According to John’s Hopkins economist Steve Hanke, last month Syrian inflation was running around 92% a month based on the Free (Black) Market rate, with an estimated annual inflation rate of 337% . Often the only way to stem the tide of hyperinflation is to switch to a more stable independent currency as Zimbabwe discovered when it began using the U.S. Dollar. Other countries, like Panama and Ecuador, have switched to the Dollar as their currency to stabilize their currency before it reached hyperinflationary conditions. 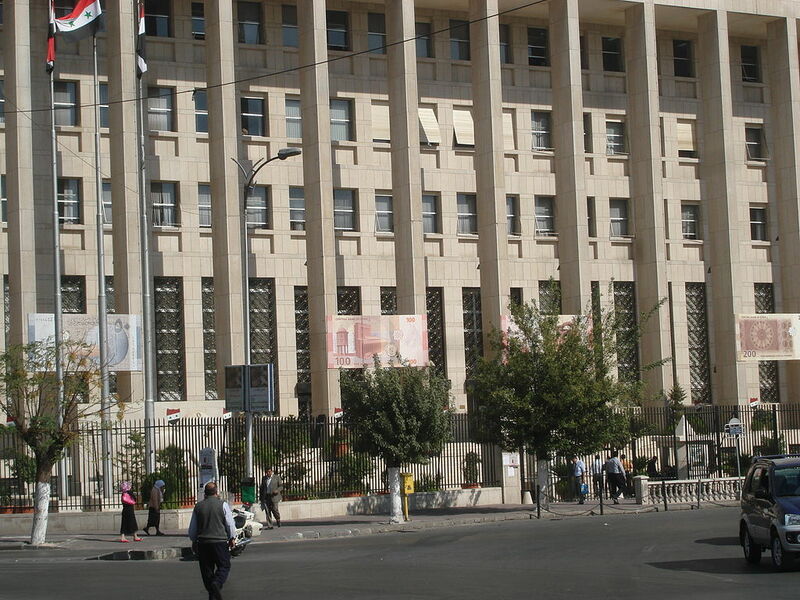 Unfortunately, it would be politically unacceptable for Syria to switch to the Dollar, so instead they have worked out a deal with Iran, China and Russia so the government is doing all its business in rials, roubles and renminbi, which has helped stabilize annual inflation at “only” 214% during the most recent month. Exchange Rate Chart Source: used under CC license.